QUBIC is a cosmology experiment project designed to study the so-called inflation period, during which time the Universe expanded extremely rapidly immediately after the Big Bang. This observation will be done by measuring the B modes of the CMB polarization. The Cosmic Microwave Background (CMB) is the signal emitted 380,000 years after the Big Bang when the light radiation was decoupled from the hot matter of the Universe and could spread freely. The scenarios modeling this period of inflation predict that it would have induced in the signal of the CMB a part polarized according to two modes called E and B. Modes B can be generated only by the impact of primordial gravitational waves amplified by inflation. The discovery and measurement of these modes B would thus be the formal validation of the existence of the period of inflation and would make it possible to discriminate among the scenarios currently proposed to model this period. It is for this discovery that the project QUBIC is conceived. 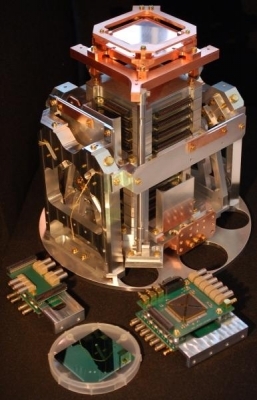 To measure these modes B, QUBIC will use bolometric interferometry, an innovative technique and alternative to conventional direct imaging techniques used by all other experiments in the field. This technique will allow to combine the advantages of interferometry (reduction of systematic errors) and those of detection using bolometers (high sensitivity to the signal). This is a strong point of QUBIC vis-à-vis competing scientific projects. Moreover, QUBIC will observe the sky on two frequencies (150 and 220 GHz), which will make it possible to discriminate the useful signal from that of the cosmological forecasts (especially dust emissions). The QUBIC project was created in 2008 by the merger of the BRAIN and MBI projects. It is currently under detailed design. 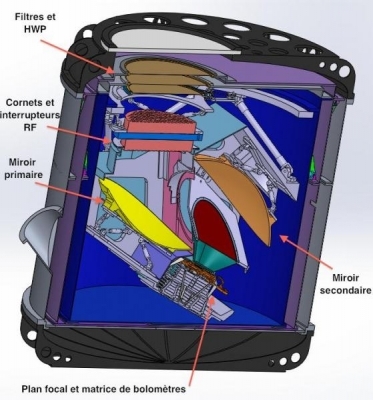 A phase of construction and testing of the instrument will begin in 2016. Scientific measurements are planned for 2018 / 2019. Longer-term complementary instruments (at 90, 150 and 220 GHz) will make it possible to refine the measurements. The QUBIC collaboration, led by APC, is made up of leading laboratories in the field of cosmology in France, Italy, the United Kingdom, Ireland, the USA and the Netherlands. QUBIC is also the only European terrestrial experiment in this scientific field.